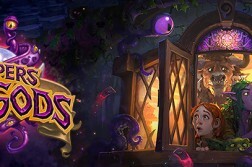 Welcome to the third part in a new series where I’m going to be giving my thoughts from the newest expansion: League of Explorers! Another Paladin secret! Any new Paladin secret that’s added will absolutely see play because of Mysterious Challenger. The potential to get a free removal will cause secret-din players to include at least 1 copy of this card. If your opponent doesn’t play around it, this card could remove a huge threat instantly. 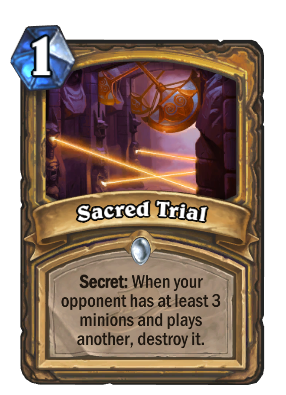 If you have it in your hand early you’d probably want to wait until later in the game to play it in order to have a higher chance of removing something valuable, but I think this will definitely be included in secret Paladin decks. 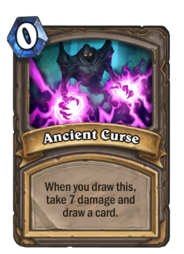 Ah, the ancient curse! I could see this card in plenty of agro Warlock, Paladin, or Rogue decks. Any deck that plans to finish the game quickly and can buff him up to keep him alive could definitely use him. Imagine Paladin – turn 3 coin + Shade into turn 4 Blessing of Kings for an 11/8. Or Rogue turn 4 Shade into turn 5 double Cold Blood for 15 damage. 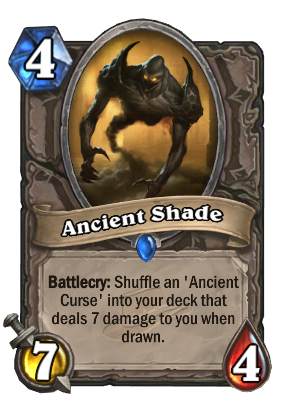 Yeah he trades down with just 4 health but you’re free to go face because his 7 attack demands a swift response from your opponent. Plus, if you finish the game early you don’t have to worry about drawing that curse. Rafaam is a very cool legendary design here. 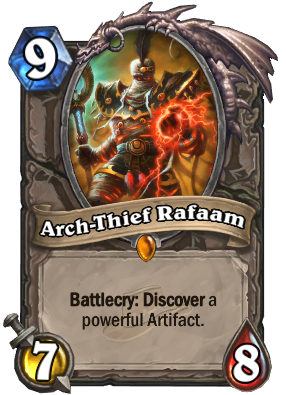 He’s not the strongest 9-drop at 7/8 but he’s really about that artifact card for your turn 10. You’ll have to already be ahead on board control in order to drop him in the first place so you probably won’t be selecting the Timepiece very often. 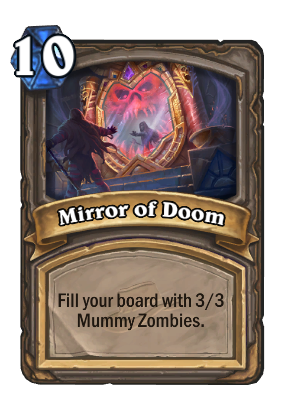 The Mirror of Doom is good if you expect your opponent is out of board clear spells, but most of the time the Lantern is probably going to be your best choice. 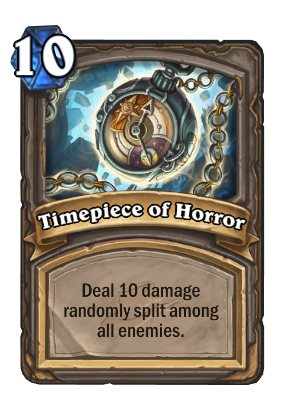 It guarantees 10 damage as long as you have at least 1 minion that can stick through your opponent’s turn. 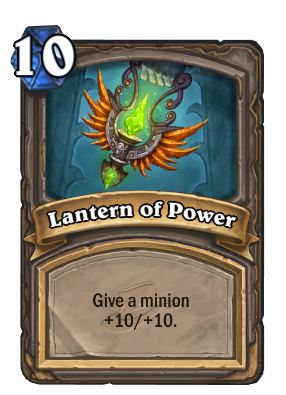 If you manage to slap it on to Rafaam himself that makes him a 17/18. He could fit into slow, control style decks (Warrior and Priest come to mind) but other than that he probably won’t see too much play. Recently I’ve been playing a Patron Warrior variant with Rafaam and it’s really fun. He provides an extra end game threat, and Mirror of Doom really screws over priests after they’ve used both Lightbombs. This card is interesting and could potentially fit into Handlock decks but probably not. Think of it this way, you pay 2 mana to deal 2 damage and lock 2 of your opponent’s mana crystals. They’re pretty much forced to play the card unless they want to keep taking 2 damage each turn. 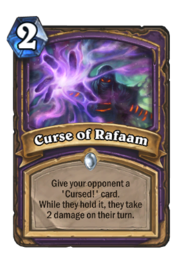 When combined with Loatheb you’d almost guarantee 4 damage from it but it’s not a very high impact card so I don’t think it’ll see much play. Next Article Americas Winter Championship Begins Friday!